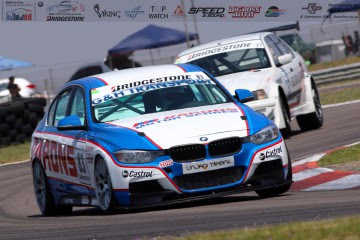 The penultimate round of the Bridgestone BMW Club Racing Series saw this popular one make series head to the Zwartkops Raceway on Thursday 24 September for another action packed Extreme Festival public holiday event. A strong field of twenty seven cars took to the track for official qualifying with the various championship contenders in each class announcing their intentions early on. 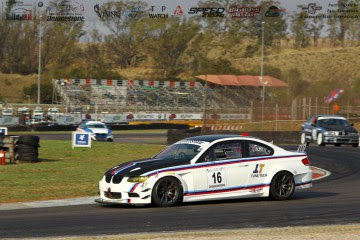 Mish-al Sing (E92 M3) narrowly took pole position ahead of Manny Ribeiro (E36 325i Turbo) with a time of 1:06.577. 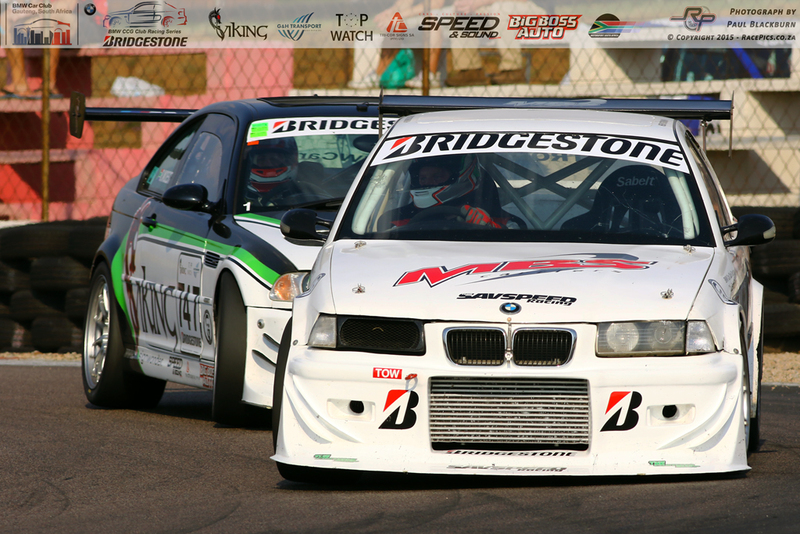 Darren Winterboer (F30 335i Turbo) placed himself on the second row with Riaan Woest (E46 M3) lining up alongside him. Julian Fameliaris (E36 328i Turbo) qualified in fifth position with Lee Jones (E39 M5) grabbing the top spot in class C by 0.075 of a second to find himself in the top six alongside Fameliaris. The start of the first race saw the large field roar through the first corner. Sing took the lead with late entry Gianni Giannoccaro (E46 M3 GTR) slotting in ahead of the rest of the field in his beautiful new look racer. Ribeiro grabbed third position ahead of Winterboer and Fameliaris. 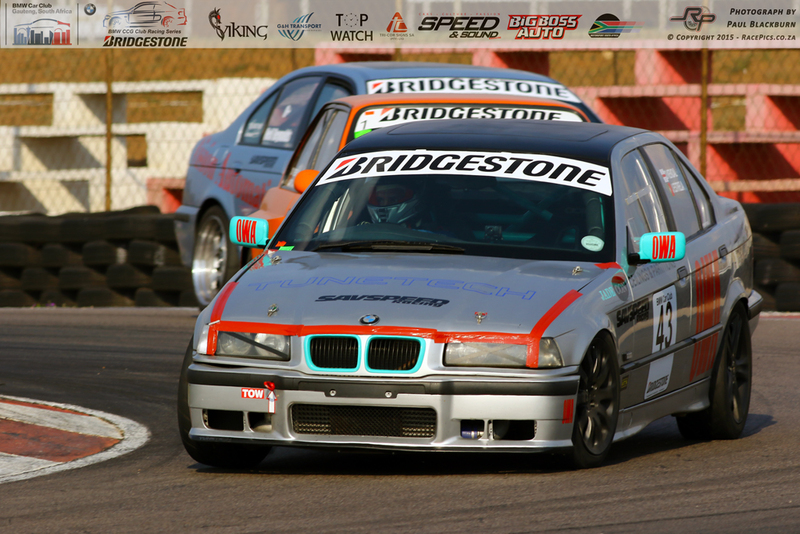 Hein Strohm (E36 325i Turbo) made a welcome return to racing for the first time this season and promptly slotted into the top six ahead of Jones and Woest. The battles throughout the other classes started early on. 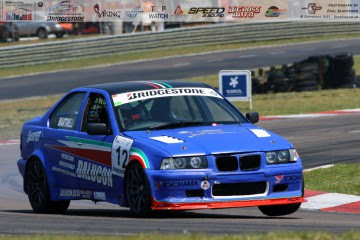 Jones was leading class C with current class leader Stefano Martinelli (E36 328i) fending off young Lorenzo Gaultieri (E36 328i). Series newcomer Dean Kendal (E36 328i Turbo) grabbed the lead ahead of the rest of the class D brat pack, with Wayne Emmenis (E30 2.8i) slotting in ahead of current class leader Mike Salt (E36 323i). Warren Dodd (E36 M3) saw his race come to an end through turn eight when engine problems retired him on the third lap. Woest was up to seventh position after getting past Jones and set about trying to catch the rest of the class B pack. The battle at the front of the field died down at the half way point of the race when two of the leading contenders retired with mechanical issues. Ribeiro came in on the fifth lap with a broken gear lever, while Giannoccaro retired to the pits a lap later with clutch issues. The battle behind the front runners was far from over however with Martinelli closing in on Jones at a rapid rate of knots. He made his move on the last lap of the race to get past the big M5 and pick up the lead in class C.
Sing was in a class of his own as he romped home to the Overall and class A victory. Second placed Winterboer took a narrow win ahead of Fameliaris in class B while Martinelli had to work very hard to take the class C honours ahead of a determined Jones. Kendal took the class D laurels in only his second competitive event in the series, with Andreas Meier (E36 328i) chasing him across the line. The second race would start with a reverse grid by class – except for Ribeiro who would have to start from the back of the twenty four car grid. Sing grabbed an immediate lead at the start with Strohm, Woest, Winterboer and Fameliaris in tow. Martinelli was quick out of the blocks and took the class C lead ahead of Gaultieri and Rick Loureiro (E30 3.0i). Ribeiro was driving like a man possessed and was up to tenth position by the end of the first lap! Paulinho Loureiro (E36 M3) took an early lead ahead of the class D brat pack with Mike Grobler (E36 328i) and series newcomer Jan Eversteijn (E36 328i) hot on his heels. The battle lines were being drawn at the sharp end of the field with Winterboer and Fameliaris grabbing second and third places respectively. Strohm was still holding Woest at bay for fourth, with an inspired Ribeiro up to eighth position by the end of the second lap. Gaultieri dropped back in the class C ranks when he missed a gear on the third lap allowing Jones to take second behind Martinelli. Ribeiro continued his charge as he slotted into the top six on the same lap. Two laps later and he was up to fourth place and set about trying to catch Fameliaris and the rest of the leading trio. Things weren’t going so well for Jorge Estrela (E36 328i Turbo) and Craig Ball (E36 328i) however with both of them retiring with mechanical gremlins on lap five and six respectively. Neil Reynolds (E39 M5) also retired two laps later when his car’s engine decided to self-destruct. Sing cruised home to take his second Overall and class A victory of the day, with Winterboer doing the same in class B. Ribeiro claimed an impressive third place ahead of Fameliaris with two laps to go. Martinelli once again proved why he is leading the Overall and class C championships with another dominant performance in his class. 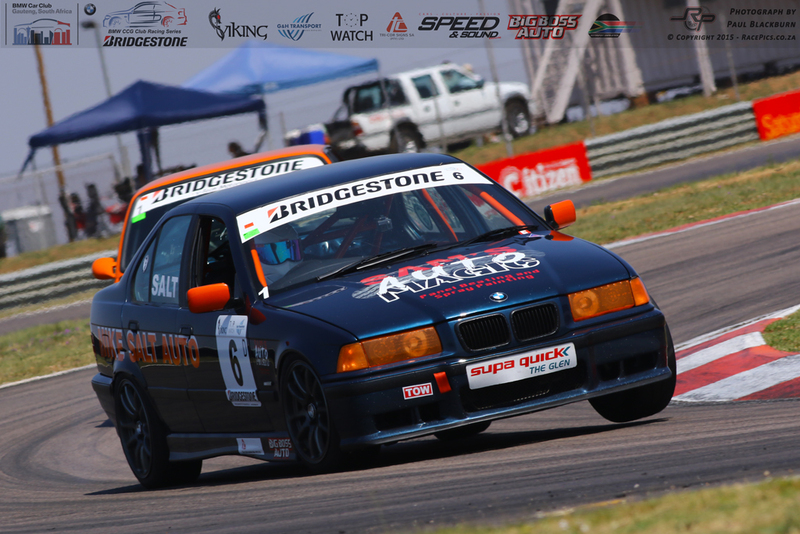 Salt was back to form amongst the class D pack and took a comfortable victory ahead of series newcomer Loureiro.  The 2015 racing season has seen some of the most competitive racing in the history of this popular club racing series. Three of the five titles up for grabs have been decided after this event. Mish-al Sing (E92 M3) has seen his hard work pay off as he can now officially claim to be the 2015 Bridgestone BMW Club Racing Series Class A Champion. 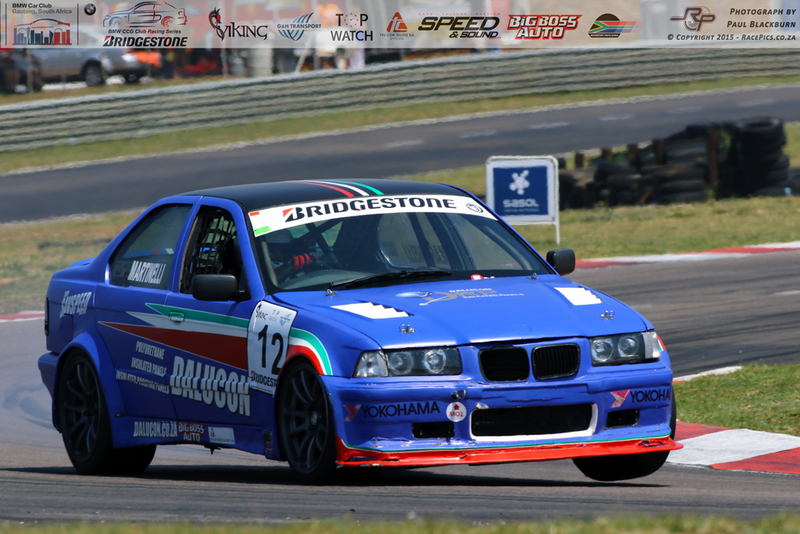 Stefano Martinelli (E36 328i) has dominated the class C ranks all season and can officially claim to be a very worthy Mike Salt (E36 323i) has been one of the most consistent drivers in his class and is certainly a well deserving 2015 Bridgestone BMW Club Racing Series Class D Champion. 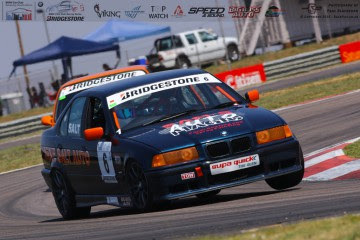 Mike Salt (E36 323i) has been one of the most consistent drivers in his class and is certainly a well deserving 2015 Bridgestone BMW Club Racing Series Class D Champion. 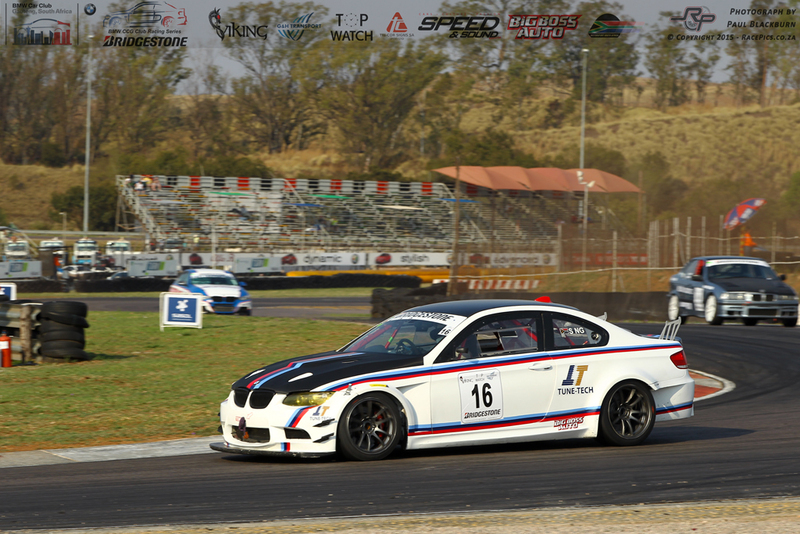 The final event of the 2015 season will see the series take on a new challenge at the Red Star Raceway near Delmas for the final round of the series on 1 November 2015. They will be breaking hallowed ground as the first tin top series to host a full race day on the technical and challenging motorcycle circuit. With the Overall and class B championships still undecided the day promises to be an exciting and action packed affair!